Chef Simon Dickinson is not just any chef feeding the average gorup of people. He feeds all the Rock n Roll Kings and Queens all over the world. 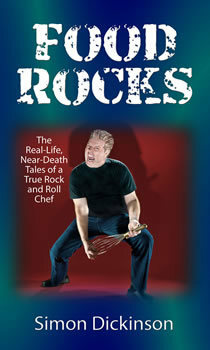 This book takes you to his back stage kitchens where he lets his magic with food go to work. He also adds some recipes for us to try out. Just think you could be making and eating some of the same foods as your favorite bands. I would of liked some more in depth tales but all in all the book is good. Chef Simon has a great sense of humor and will have you laughing out loud throughout the book as well as drooling over some of his creations. Oh yea and there are pictures! !